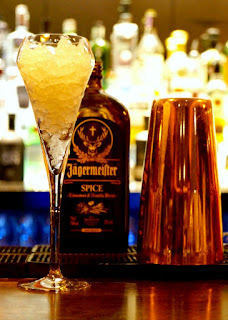 Fancy a German supperclub themed around Jäger cocktails? This Easter - Thurs 24th and Fri 25th -Jägermeister is teaming up with Berlin brünch to host two evening dinners, at the Palm2 in Clapton. The £48 ticket gets you a welcome cocktail, and then 5 courses of hearty German food, each paired with a Jägermeister cocktail. This is one opportunity you have to grab with both hands! "On 24th and 25th of March, this German dream team will take centre stage at Palm 2, a hidden gem in the heart of Clapton, located above a local Deli. This East London venue will transport you right to the middle of Berlin for a Jäger night whilst up-and-coming DJ Massaï spins those Electro tunes. brünch sparked a real brunch movement in London during 2015, bringing proper Berlin vibes to the capital. Don’t expect any less fun, passion or attention to detail from this upcoming dinner feast! The five courses are designed to be shared among the table. It is all about 'getting together to break bread and meeting new people', says Noemi, founder of brünch. The evening will kick off with a Jäger welcome cocktail from the bar and hunter's popcorn whilst getting to know one another before dinner. A bread station, filled with artisan sourdoughs will invite you to taste the best of home-cured JägerSalami by Hackney Wick's local Blackhand Food together with German herb quark, mustards and pickles. Move to the table for starters - smoked mackerel on pickled beetroot and a dill and horseradish cream. For mains, generous sharing platters of German meats and vegetarian treats will be brought to you. Indulge in cornflake and nutmeg crusted veal schnitzel, bratwurst sliders on home-made sauerkraut, cheese spätzle with truffle oil, red cabbage, carrot and almond slaw, and last but not least Berliner Kartoffelsalat. Make sure to leave room for dessert! Rote Grütze, a popular pudding from northern Germany, will be served with home-made vanilla creme. To round up the evening German style, nibble on some home-made chocolate marzipans and join Jägermeister at the bar for more drinks and tunes. Fear not about the next day, it's bank holiday weekend so make the most of your night! For only £48pp you receive a welcome cocktail, a five-course German hunter's feast paired with Jägermeister's finest creations - five cocktails in total. All of that in the company of a live DJ and beautiful people. Wine, German beers and Berlin soft drinks will be available to buy separately at the venue."